If you have an appointment scheduled with us, please download our New Patient Forms. Read them over thoroughly, complete the questions and bring it with you to your appointment! We look forward to seeing you soon. If you are an ADULT (over 18 years of age) patient paying with cash or using standard health insurance or Medicare, use this form. If you are a MINOR (under 18 years of age) patient paying with cash or using standard health insurance or Medicare, use this form. If you are an ADULT OR MINOR patient seeking treatment for an auto or other personal injury, use this form. If you are an ADULT OR MINOR patient seeking treatment for a work-related injury, use this form. If you are an ADULT OR MINOR patient interested in Cranial Facial Release Technique, use this form. If you are an ADULT OR MINOR patient interested in Orthotics or Correct Toes, use this form. 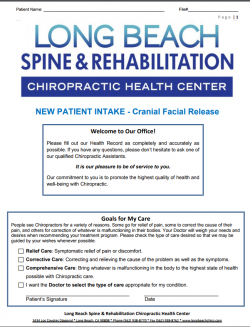 "I came to Long Beach Spine & Rehabilitation because I was having pain and discomfort after being in a car accident. Chiropractic care has helped me because the pain and discomfort I was experiencing has been replaced with ease and greater range of motion in both the neck and back regions. Being adjusted and receiving therapy is like WD-40 for the neck and spine. It is a painless way to le"